ONLY THE KING OF OBSOLETE WOULD ORGANIZE AN OUTHOUSE PARTY IN THE GREAT WHITE NORTH. IT WAS ALMOST A YEAR IN THE MAKING AND IT WENT SO SMOOTHLY FOR SOMETHING BEING PLANNED. (I DON'T LIKE MAKING PLANS BECAUSE THEY NEVER WORK OUT BUT THIS TIME THEY DID.) IN AUGUST 2007 WE STAYED AT THIS CABIN OWNED BY MY AMERICAN FRIEND ONLY TO FIND OUT THE OUTHOUSE WAS IN REALLY REALLY BAD SHAPE. 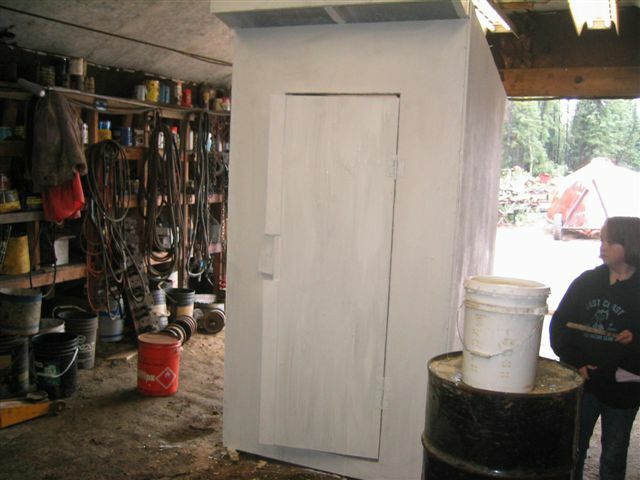 I DECIDED TO BUILD AN OUTHOUSE FOR HIM OUT OF RECYCLED LUMBER IN MY LITTLE SHOP. WHICH WORKED GOOD BECAUSE IT WAS THE START OF THE RAINY SEASON. I EVEN INCLUDED A FANCY WOODEN SEAT WHICH WILL BE NO GOOD TO SIT ON AT -45C. 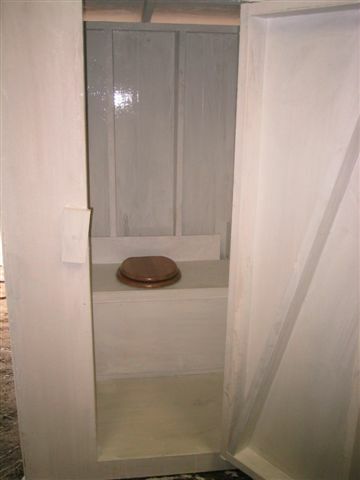 FOR THE BEST WINTER OUTHOUSE SEAT CLICK ON TO THE ROCKET TOUR. I TALKED MY FRIEND MARK IN TO DELIVERING THE OUTHOUSE TO THE BOAT LAUNCH AT THE LAKE. OF COURSE WE HAD TO STOP BY THE GAS STATION SO EVERYONE COULD SEE US WITH THE OUTHOUSE. MY AMERICAN FRIENDS SHOW UP AND TOWED THE BOAT WITH THE OUTHOUSE ACROSS TO THE CABIN BUT SOMEONE FORGOT TO PUT THE PLUG IN THE BOAT THAT HAS THE OUTHOUSE. ABOUT 100 FEET FROM THE DOCK AT THE CABIN, THE OUTHOUSE AND THE BOAT WERE SITTING ON THE BOTTOM OF THE LAKE IN 5 FEET OF WATER. THIS IS NOT A BIG PROBLEM BECAUSE AT LEAST THE OUTHOUSE IS ALMOST TO THE CABIN. MY AMERICAN FRIENDS SPENT A DAY TO GET THE OUTHOUSE AND BOAT TO SHORE. THE WATER IN THE FALL IN THE GREAT WHITE NORTH IS NOT THE WARMEST. PLUS THEY HAD TRAVEL 40 HOURS NON STOP TO FISH AND NOT TO PLAY WITH AN OUTHOUSE IN THE WATER. THE OUTHOUSE WILL SPEND THE WINTER ON THE SHORE OF THE LAKE WAITING TO BE MOVED BEHIND THE CABIN. WE START MAKING PLANS TO MOVE THE OUTHOUSE IN AUGUST 2008.